A bit of history pertaining to the Cities of Pittsburgh, Allegheny, and the region relative to the brewing business. Allegheny City was in existence from 1788 to 1907 when it was annexed by Pittsburgh after the passage of the Cook Bill (below) in the State Legislature. It became a borough in 1828 and became a city in 1840. Allegheny County was officially created on September 24, 1788, from parts of Washington and Westmoreland counties. When Allegheny was formed it extended to Lake Erie. See: Historic Maps and the Allegheny County page. Butler, Crawford, Mercer and Erie Counties were formed from Allegheny on March 12, 1800. 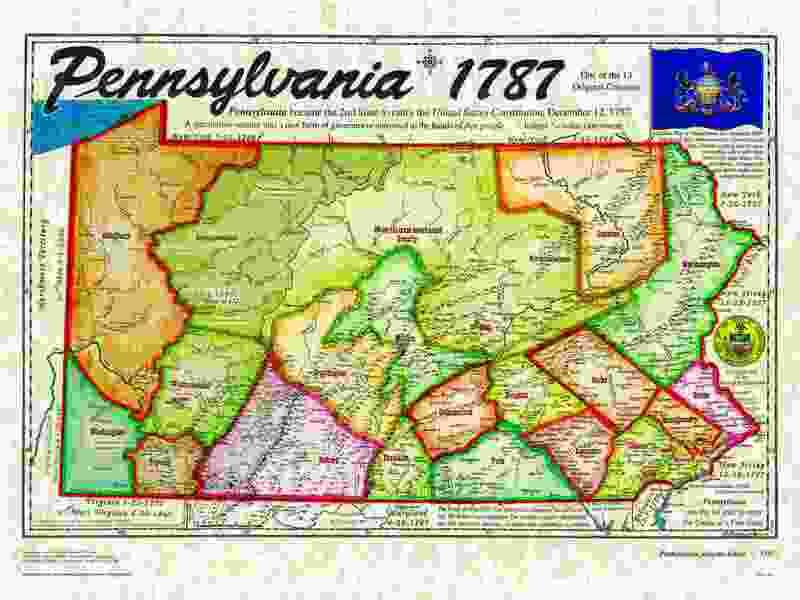 Beaver, Armstrong and Warren Counties were formed from Allegheny on March 12, 1800. Venango County was formed on March 13, 1800. Property is identifies by the County of Allegheny by Lot and Block numbers. Lot numbers are written as 100-L-212. Should you see this in my descriptions you will be able to research the property using deeds in the Allegheny County Office Building. This is the link to the Lot & Block Index for property within the City of Pittsburgh. Robert Liddell of the Phoenix Brewery served as mayor of Pittsburgh from 1878 to 1881. Leopold Vilsack of Pittsburgh Brewing Company was elected to Pittsburgh City Council but died prior to taking the oath. The Federal Government issued permits to brewers during and after Prohibition. L permits were issued during prohibition to brew non-alcoholic beverages and U permits for beer after the repeal. Occurred in 1854 in which the newspapers reported 400 people died over a period of two weeks in September. It is not know if any area brewers or brewery owners died from cholera but a person was identified to ne near Wood’s Brewery. This is the name given to the bill that was passed by the Pennsylvania legislature in 1906 allowing the merger of Allegheny City and the City of Pittsburgh. It was also known as the Greater Pittsburgh Bill, which for the first time coined the name Greater Pittsburgh. Formed as a borough on April 5, 1849 by an act of legislature. The west boundary was Chestnut Street and east at Girty’s Run. It was from the Allegheny River (including Herr’s Island) and extended to Lowrie Street. Allegheny City annexed Duquesne on March 18, 1868. See the Cook Bill, above. The moniker Iron City was first used to denote Pittsburgh in the 1840’s. John N. Straub was the first brewer in Allegheny County to brew lager. He learned in 1848 that it was being used in Philadelphia since 1842. He was able to acquire some and had it shipped by boat via the Pennsylvania Canal to Allegheny City, which was adjacent to his brewery on South Canal Street. Before the creation of the Liquor Control Board, and prohibition, those looking to sell alcohol had to appear before a judge in Liquor Court in Pittsburgh. You could have been denied a license if evidence showed that you served to persons of ill repute. Here’s a fun fact: Water is water but when it is added to a brewer’s mash tun it is called liquor. Opened in 1829 and the first boat to arrive in Pittsburgh was on November 10th. The canal went out of service in1854 with the coming of the railroads. Pittsburgh was incorporated as a borough in 1794 and chartered as a city in 1816. Pittsburgh became the county seat in 1791. A fire started in a cabinetmaker’s shop on December 13, 1825 and destroyed 30 tenements “and an extensive brewery”. This brewery was Brown & Verner’s on Penn in Downtown. The fire started at the corner of Second Street (Avenue) and Ferry Street (Stanwix Street) about noon on Aril 10th. The fire took as many as 1,200 buildings and displaced about 12,000 people yet only two perished. Many neighborhoods were villages, towns or boroughs until they were annexed by Pittsburgh. See the Allegheny page for a listing and dates of neighborhoods, boroughs and townships in Allegheny County. Pittsburgh was spelled without the h from 1891 until 1911. Prior to 1891 it was common for many cities to have the h in burgh. My house is late 1800’s and the cast iron coal chute has the name Wilkinsburgh Hardware cast on the front. See PHLF Controversial Spelling PDF. Pittsburgh originally had three wards that were identified as A, B, and C. and then named North, South and West. When the Northern Liberties (Strip District) became a part of Pittsburgh in 1837 (and the Fifth Ward) the wards were denominated: First, Second, Third, Fourth and Fifth. In 1907 the wards were re-numbered when Allegheny was annexed. Allegheny City had 9 wards when it was annexed by Pittsburgh in 1907, in which the wards were re-numbered. National prohibition controlled all aspects of brewing, transporting, processing and drinking of alcohol except with limited restrictions. Many breweries in Pittsburgh closed permanently with Ft. Pitt Brewing, Independent Brewing and Pittsburgh Brewing surviving. Prohibition lasted from 1920 until 1933. Breweries that did not close changed their names and went into other business ventures. After prohibition they went back to brewing. Much of the land south of the Monongahela and Ohio rivers were in various townships of St. Clair. What is now South Side was once St. Clair and parts of Brookline was in Lower St. Clair. Parts of St. Clair Township were annexed on February 7, 1924. Montooth was south of Beltzhoover and was annexed in 1907. A number used in conjunction with a street name identifies the property’s location relative to other properties. Today, “house” numbers are in numerical order following a direction and alternating from one side of a street to the other. This was not always so. For example, Penn and Liberty were numbered in which lots on one side of the street were numbered in consecutive order with 1 near the point and continuing far into the end of the Strip District. Researchers should be aware that street numberings might have been changed from our past to present days. Pittsburgh changed the street numbering system in 1884. Both Pennsylvania and Virginia claimed the lower section of western Pennsylvania. The dispute was resolved in 1879-1780 by extending the Mason-Dixon Line west to a line (known as a meridian line) 5 degrees longitude from Delaware. This set the border between the two states. West Virginia was formed on June 20, 1863. Prior to that date it was integral with Virginia. Many sources cite the name West Virginia when referring to it prior to 1863 if the citation was made after 1863. James E. McWilliams in A Revolution in Eating: How the Quest for Food Shaped America, Columbia University Press, Nov 1, 2007, page 315, denotes Shiras and Smith opening “their Virginia Brewery”. Smith and Shiras operated the brewery in Pittsburgh, Pennsylvania in 1795.